(2011) Andrea Grover, et al. 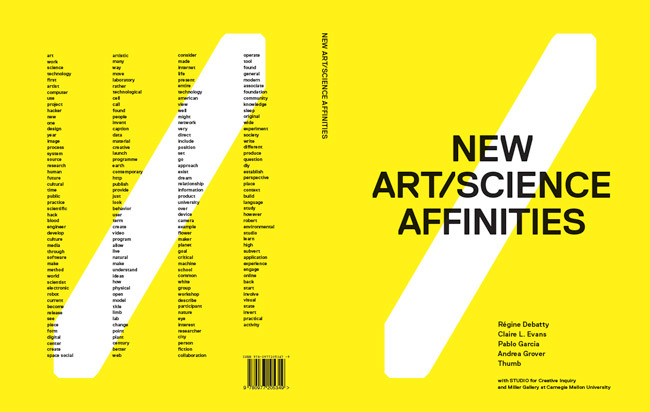 The STUDIO for Creative Inquiry and the Miller Gallery at Carnegie Mellon University have co-published “New Art/Science Affinities,” a 190 page book written and designed in one week by four authors ( Andrea Grover, Régine Debatty, Claire Evans, and Pablo Garcia) and two designers (Luke Bulman and Jessica Young of Thumb), using a collaborative authoring process known as a “book sprint” (see A/S/T Book Sprint STUDIO project page). Derived from “code sprinting,” a method for working on an open source project by getting software developers into a single room for a period of intensive work, the term book sprint describes the quick, collective writing of a topical book. The topic of “New Art/Science Affinities” is contemporary artists working at the intersection of art, science, and technology, with meditations, interviews, diagrams, letters and manifestos on maker culture, hacking, artist research, distributed creativity, technological and speculative design. Chapters of the publication include: Program Art or Be Programmed, Subvert!, Citizen Science, Artists in White Coats and Latex Gloves, The Maker Moment, and The Overview Effect.